Médecins Sans Frontières (MSF) began providing antiretroviral therapy (ART) in 2000 and has today reached over 80,000 people in more than 30 countries. However, efforts to further increase access to treatment and maintain and improve quality of care are coming up against a wall due to the severe shortage of health workers. This is contributing to unnecessary illness and death. 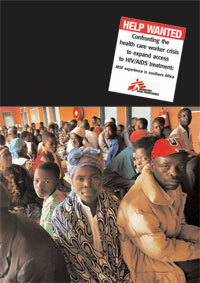 The impact of the human resource crisis is witnessed by MSF across southern Africa, the epicentre of the AIDS pandemic. Health workers are overwhelmed, overworked, and exhausted. In Thyolo district in Malawi, a single medical assistant can see up to 200 patients per day. In Mavalane district in Mozambique, patients are forced to wait for up to two months to start treatment because of the lack of doctors and nurse clinicians; many have died during the wait. In Lusikisiki, South Africa, utilisation of clinic services almost doubled in two years while the number of professional nurses remained constant. In Scott Hospital Health Service Area in Lesotho, over half of professional nursing posts at health centres are vacant while the HIV-associated workload is increasing sharply. HIV/AIDS has not only created extraordinary demands for health care in areas where health systems are already weak and overwhelmed, but is also decimating the health workforce. In Lesotho, Mozambique, and Malawi, death is the leading cause of health worker attrition, with a significant proportion being HIV-related. Many countries in sub-Saharan Africa are implementing ambitious plans to roll out AIDS treatment and ART coverage has increased significantly: between 2003 and the end of 2006, the number of people on ART in sub-Saharan Africa increased from 100,000 to 1.3 million. But still today, more than 70% of those estimated to need treatment in sub- Saharan Africa are not getting it. The shortage of health care workers is widely recognised as a major barrier to reaching those who still urgently need ART.2,3,4 However, emergency measures have not followed the many expressions of concern about the need to stem the health care worker crisis. International pressure was effective in bringing down antiretroviral (ARV) drug prices dramatically and jump-starting HIV/AIDS treatment programmes when many still believed it would not be feasible to provide ART in resource-limited settings. This pressure is still needed to make sure people with HIV/AIDS in developing countries will have access to both newer, improved first-line ARVs and second-line ARVs. Access to drugs is a necessary condition, but will not be enough to save millions of lives at risk unless priority is also given to ensure the necessary personnel to provide treatment. This report focuses on the impact of human resource shortages witnessed by MSF teams in four southern African countries - Lesotho, Malawi, Mozambique, and South Africa. While the focus is largely on nurses in rural areas, it should be acknowledged that health staff is lacking across the spectrum - from doctors to laboratory technicians to pharmacists - at all levels of care. The report also describes how MSF teams and local partners are trying to overcome staff shortages to reduce waiting times and increase access to care. The experiences described in this report illustrate the need for an effective emergency response at the national and international level. Without fundamental change, the perspectives for expanding access to ART and improving quality of care are bleak. And the cost of inaction is clear: hundreds of thousands of people with HIV/AIDS will die unnecessarily because there will not be the necessary personnel to provide the life-saving care and treatment they need.